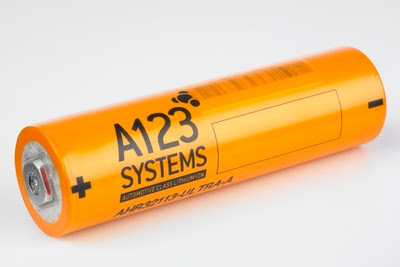 A123 Systems today provided an update regarding the previously announced asset purchase agreements with Wanxiang and Navitas. Wanxiang Group Corp., a Chinese auto parts maker whose North American headquarters is in Elgin, Ill won A123 Systems at an auction in December against bidders Johnson Controls, NEC Corp. and German electronics giant Siemens AG. A source close to the deal said the purchase price was about $250 million. Wanxiang was excluded from the purchase A123’s U.S. government and military contracts. Wanxiang, a unit of China's Wanxiang Group, made an offer to purchase the lithium-ion-battery maker earlier this year when a $465 million deal collapsed. A123 continues to work with Wanxiang and Navitas to prepare for the closing of the transactions contemplated by the asset purchase agreements. A123 currently expects that the transactions will close pursuant to the terms set forth in the asset purchase agreements by February 1, 2013.